Magne, Martin and Jonas did their first Apparatjik concert of the year on Friday, May 3rd, with a 14-song set at the National Gallery of Denmark (SMK) in Copenhagen. 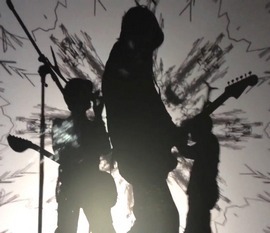 A reviewer at Danish music website Gaffa praises the “extremely well planned audiovisual bombardment of the senses” and gives the concert 5 out of 6 stars. Although he feels the music lacks an emotional quality, he says the show “worked incredibly well throughout its compact 49 minutes”. Guy Berryman attended Magne’s exhibition opening in London on Thursday, but did not join the others for the concert in Copenhagen. The busy Coldplay-bassist last performed with Apparatjik in March 2011, and has been replaced with a stand-in at every performance since then. Lowell had taken the trip over from Canada, though, and came on stage to do her two songs “Shake Him Off” and “The Birds”. Meanwhile in Oslo, a new sculpture by Apparatjik has apparently been installed outdoors at Tjuvholmen. 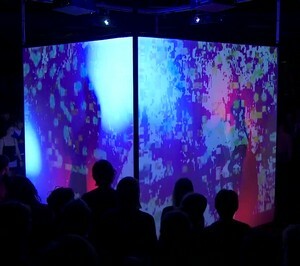 Apparatjik will play at the National Gallery of Denmark in Copenhagen on May 3rd, gaffa.dk reports. Last summer the band presented a spectacular show for an audience of 50.000 people at Denmark’s Roskilde Festival, but this time they’ll be playing inside the cube. Tickets are available now, from billetlugen.dk. In other Magne news, he presented In Transit at Tronsmo bookstore in Oslo last week (February 13th) with his right arm in a sling. He didn’t say what had happened, but he has previously broken his left arm in three separate snowboard accidents. 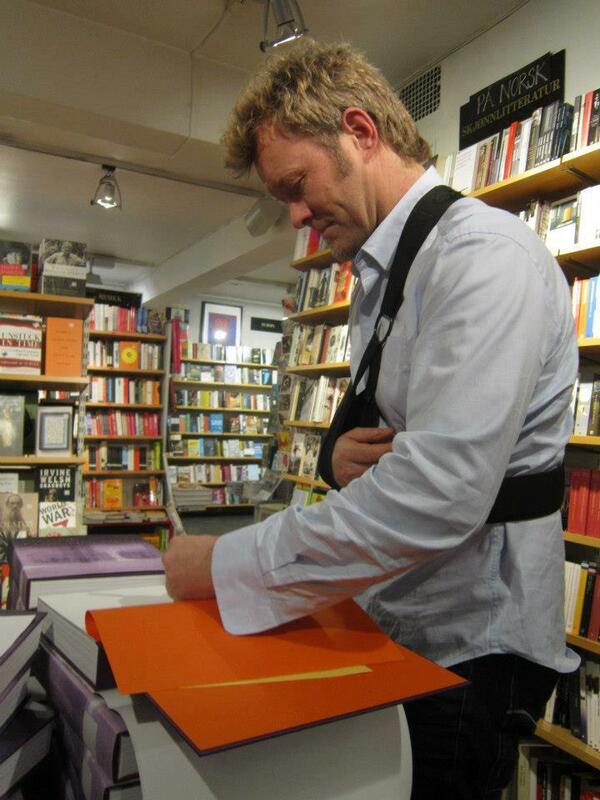 Luckily Magne is left-handed, so he had no problems signing the book.